I tried to create a connection for Sitecore 9 instance in Sitecore Explorer. Right click on "Connections" in Sitecore Explorer and press "New Connection"
I've got a window with below message. Press "Yes". I've chosen "Update All" and then press "Ok". In browse window I've chosen folder with Sitecore 9 instance and press "Ok". 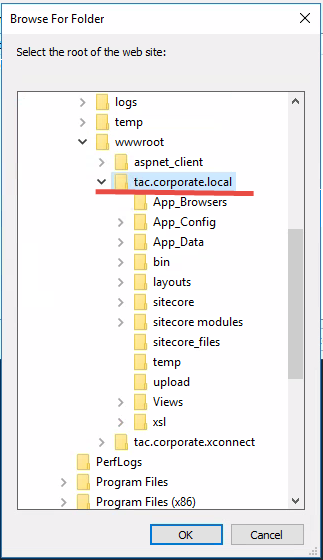 In previous version of Sitecore there was folder Website for it, but in Sitecore 9 there is not anymore that folder. Result - I've got a message - "Got a No Service error". Can everyone explain how I can create connection? Thanks! 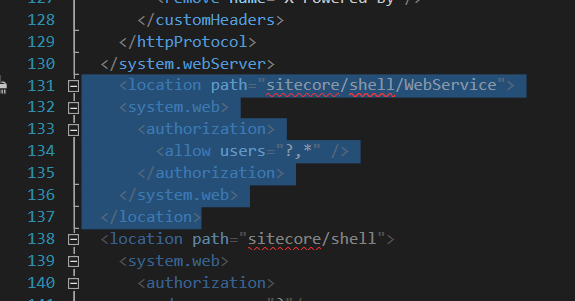 It's a permission issue that started on Sitecore 9. You have to add this section to your Web.config. Please, read this blog post from Rob Ahnemann to learn more. One of my colleagues helped to find a solution! Press right button of the mouse on connection -> Connections -> Edit connection properties and then uncheck "UseDefaultWebProxy". In some reason it was set by default. UPD When you uncheck "UseDefaultWebProxy" you can have another bug - exception when you try to delete some item (template). 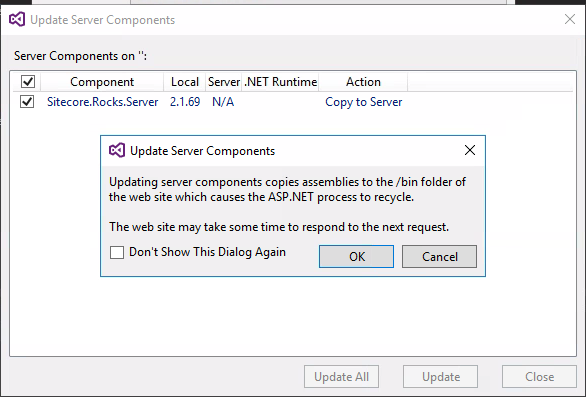 To fix this use this artifact - https://ci.appveyor.com/project/JakobChristensen/sitecore-rocks/build/artifacts and then set "UseDefaultWebProxy" to check position. 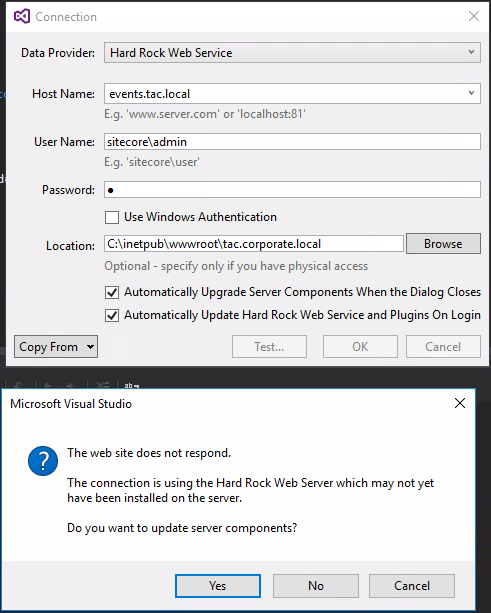 This should no longer be an issue as of Sitecore Rocks 2.1.126, which is now available on the Visual Studio Marketplace, if you install the latest Hard Rocks service. It now includes a local Web.config which will do the necessary security configuration for both the Hard Rocks and Good Old web services. If you need to use the Good Old service for some reason, you do still need to provide your own authorization override, as described in other answers and this Sitecore KB article. If you wish to use Rocks with a remote system, the Rocks GitHub releases now include an Update Package as well with the latest Hard Rocks service, including the authorization override. Note that this is not recommended for production use. 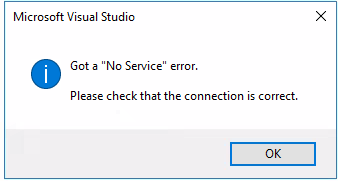 Also, make sure that you are on Visual Studio on Administrator. This one resolved the issue, after implementing all the above settings. Not the answer you're looking for? Browse other questions tagged sitecore-rocks or ask your own question. How to increase request timeout for rocks connection? 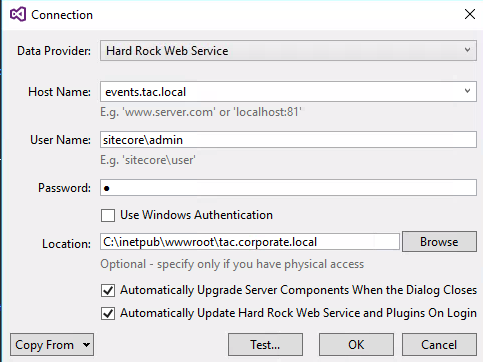 How to create a Sitecore Rocks connection to a dev/test environment running in an Azure Web App?